Victoria, Mahe (Seychelles) – February 6, 2018 (travelindex.com) – The Seychelles tourism arrival figures for the month of January have been released. Transit passengers are on the rise and tourism arrivals are decreasing in comparison to 2017. It is often said that when Seychelles tourism sneezes, the country immediately suffers from a viral infection. Case in point: visitor arrival numbers for January 2017 stood at 20886, but January 2018’s figure is 19598. Similarly, the transit passengers figure for January 2017 was 422, and in 2018 it is 1895. This reveals that our Country’s efforts have shifted from point to point air transport to playing airline hub. It is not the Seychelles tourism industry we were caring for, but rather we are filling planes from Johannesburg to Mumbai in India and from Madagascar to Paris. This is particularly bleak news when considering that the Emirates Airline is now reduced to a single flight from Dubai to Seychelles per day, a drop of seven flights per week. Air Seychelles is stopping its Paris flights and, as the National Airline, they represented 24% of market share and Emirates on its part had a 37% of market share. Captain David Savy, the Chairperson of the Seychelles Civil Aviation Authority (SCAA), said this at the Chamber of Commerce and Industry meeting. Captain Savy was also a former Board Member of the Seychelles Tourism Board (STB) and spoke passionately about the challenging times for tourism in Seychelles, cautioning everyone on optimistic forecasting. Seychelles is digesting the sudden resignation of the Rt. Hon. Patrick Pillay, the Speaker of the National Assembly. This has prompted the organisation of a hurried bye-election in the electoral district of Anse Boileau, and has set many tongues wagging about the apparent and undeniable fissure in the fragile cohabitation our politicians have been vehemently defending for over a year. Grimmer still, the marketing budget for STB was not increased as anticipated for 2018. Further, the Governor of the Seychelles Central Bank, Mme Caroline Abel, has on her part alerted the Country of the depreciation of the Seychelles Rupee versus the UN Dollar and the Euro. However, these statistics are being somewhat overshadowed by the news that Seychelles will be having an Indian Military Base on Assumption Island situated right at the doorstep of Aldabra, the UNESCO World Heritage Site. Assumption (Assomption) Island is but some 20 nautical miles from the UNESCO World Heritage Site of Aldabra. The Seychellois who have been privileged enough to visit this island are unanimous in their view that it is a gem which ought to be preserved. 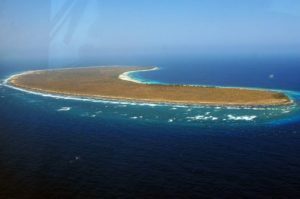 If it is to be taken over by a Power Military Base, not only may this island be barred from access by Seychellois, but can it still be used by those needing easy access to Aldabra to further conservation efforts? UNESCO, environmentalists and concerned citizens of Seychelles must be questioning the rationale of having a Power Military Base established so close to one of our prized possessions: Aldabra. Given the lax policing of our waters, owing to our extensive territorial size, some are advocating that additional security cannot be a negative. However, it is unknown whether the new occupiers of the Island are actually going to assist with protecting our vulnerable shores from poachers or pirates, or whether they are moving into the Aldabra Group with an agenda of their own. Aldabra is the Galapagos of the Indian Ocean and has been staunchly protected by Seychelles since it attained its Independence from Great Britain. Many are contemplating bringing a Constitutional petition before the Courts to challenge the constitutionality of this deal between the Indian Military and Seychelles to India, and to hopefully reverse it. We the people of Seychelles should never underestimate the power we have to challenge oppressive, and potentially harmful, decisions taken by the Government we elected into Office, which may impact our sovereignty, our Country’s environmental well-being and our security. Our impartiality and neutrality in international politics may soon be affected if we allow the deal to go ahead. Air Seychelles is still very much in the news and the fate of the Seychellois staff is becoming a national problem. This is the Island’s National Airline and the security of its Seychellois Staff must become a cause for concern for every Seychellois. Their “new strategic transformation plan aimed at ensuring the long-term profitability and sustainability for the airline” is seriously being seen as trampling on the feet and livelihood of the people of Seychelles. The Travel Advisory issued by the UK does not seem to be putting the needed pressure on the Government and the National Assembly. This week, Tour Guides posted photos of cars broken into at the Mission Lodge viewing spot at Sans Soucis, a famous touristic spot on Mahe. Tourists are being shamelessly robbed and something needs to be done to protect visitors to known scenic spots around the islands. As a country, we are failing in our duty of care.